Make your home as guest-friendly as possible using these helpful tips, just in time for the holiday entertaining season. Offering plenty of space to store shoes, keys, and coats helps make guests feel welcome as soon as they enter your home. Depending on how much space is available, anything from a temporary folding shoe rack to a hutch or organizer that stays permanently could do the trick for a reasonable price. Here's a link to storage ideas at Bed Bath & Beyond. Sometimes it's the little things that create special touches! 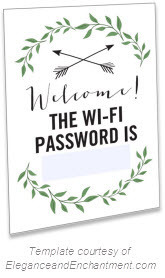 Here's a stylish template from the Elegance and Enchantment blog that you can use to print out and share your Wi-Fi password. (The link to the template is below the very last photo in the post, or click on the image here.) After downloading, open it in Adobe Reader and you'll be able to type in the Wi-Fi code. Would decreasing traffic to the kitchen area make life easier for you and your visitors? If so, an in-room mini-fridge might be a good idea. Pair this with a small microwave or a coffee maker and you might just find yourself checking in with your guests to make sure they're still there. :) Currently Amazon has some nice-looking mini-fridges with good reviews, like this Magic Chef for sale for under $125. A simple luggage rack can be helpful to guests who would like their suitcase out of the way without feeling like they have to unpack immediately after a long trip. If closet space is tight, consider an easy-to-assemble free-standing closet as well. This Whitmor free-standing closet costs under $40 and can be taken apart and stored until it's needed again. Is there a space in the kitchen for a dedicated coffee station with plenty of cups and coffee fixings? This is a great way to make guests feel welcome, and also eliminates a lot of "Where is the...?" questions on the first morning. Even if you're not much of a night light person, they can make life far easier for guests (especially children) who might have to find their way to the kitchen or bathroom during the night. 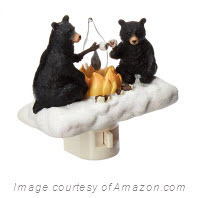 Choices run from minimalist styles to the strangely tempting "bears toasting marshmallows" motif. Make sure everyone knows where the exits and fire extinguishers are, and where to gather if there's an emergency. - U.S. home prices rose 6.8 percent year-to-year in August, according to a recent S&P/Case-Shiller report. They rose 7.0 percent year-to-year in September, according to CoreLogic, a data and analytics company. The September Pending Home Sales Index dropped 3.5 percent year-to-year, according to the National Association of Realtors®. A fun list of ideas from the MidwestLiving website. Designed by engineers, Acopian BirdSavers are highly successful at preventing bird strikes on windows. The website also offers easy do-it-yourself instructions. A classic stuffing recipe (sans sausage, bacon, or potatoes) that can also be made vegetarian by substituting vegetable broth for the chicken broth. 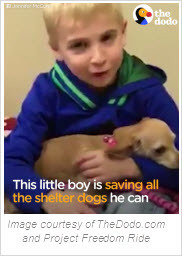 Roman's mother, Jennifer McConn, runs "Project Freedom Ride", a group that rescues dogs from high-kill shelters in Texas and brings them to Washington for adoption.